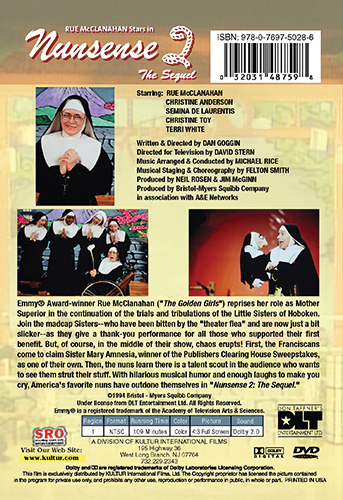 Emmy Award-winner Rue McClanahan ("The Golden Girls") reprises her role as Mother Superior in the continuation of the trials and tribulations of the Little Sisters of Hoboken. Join the madcap Sisters--who have been bitten by the "theater flea" and are now just a bit slicker--as they give a thank you performance for all those who supported their first benefit. But of course, in the middle of their show, chaos erupts! First, the Franciscans come to claim Sister Mary Amnesia, winner of the Publishers Clearing House Sweepstakes, as one of their own. Then, the nuns learn there is a talent scout in the audience who wants to see them strut their stuff. With hilarious musical humor and enough laughs to make you cry, America's favorite nuns have outdone themselves in "Nunsense 2: The Sequel."